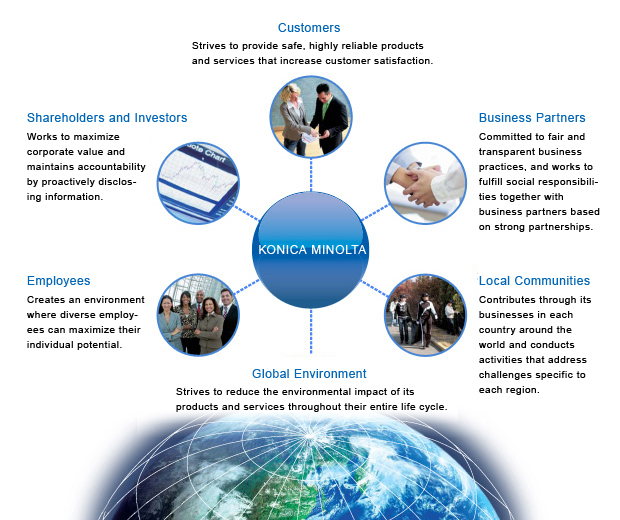 The foundation of the Konica Minolta Group's corporate social responsibility (CSR) activities consists of its management philosophy of “The Creation of New Value” and the practice of the Konica Minolta Group Charter of Corporate Behavior. The management philosophy of “The Creation of New Value” refers not only to the value of a product's convenient functions or ease of use, but also the Group's identification and achievement of value required by the times in which we live, in the areas of the economy, the environment, and society. Based on this management philosophy, the Konica Minolta Group Charter of Corporate Behavior was established to provide guidelines for the Group to transform itself while interacting with society in order to make a greater contribution. Each and every person who works in the Konica Minolta Group undertakes CSR activities in every aspect of the company's business activities in accordance with the Charter of Corporate Behavior. The Group aims to become an organization that can be trusted and that can be counted on, by fulfilling its responsibilities to its various stakeholders and by helping to realize a sustainable society. The Konica Minolta Group develops CSR activities from the standpoint of what is necessary to be a corporate group that is both supported by and essential to society. Consequently, we work to understand the concerns and desires of our stakeholders through various means of communication. The Group identifies the issues deemed to have higher social priority and greater impact on business, and establishes group-wide key objectives in a medium-term plan for themes including the environment, product quality (customers), occupational safety (employees) and others. These objectives have been incorporated into the business plans of each business company in line with the “G PLAN 2013” medium-term business plan that began in April 2011, and are being dealt with through their business activities. Currently, the Group is revising its CSR activities using ISO26000, the international standard for social responsibility issued in November 2010, to coordinate the direction of medium-term development and other issues. After verifying specific items, the Group plans to formulate a new action plan going forward.